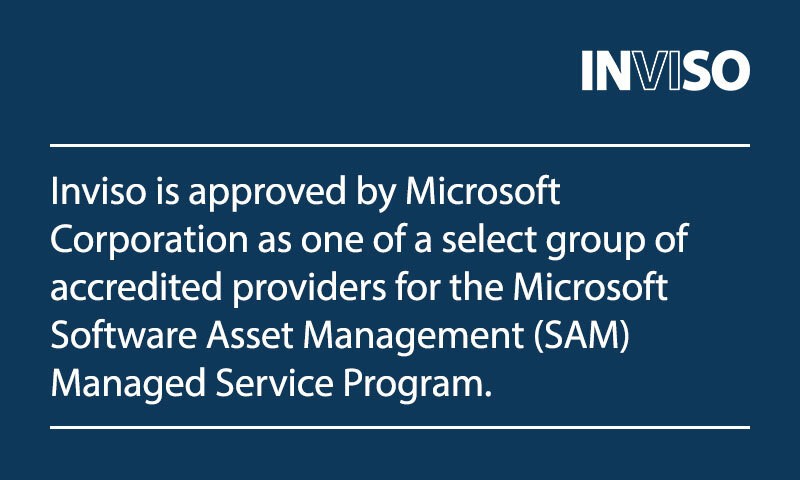 Inviso is approved by Microsoft Corporation as one of a select group of accredited providers for the Microsoft Software Asset Management (SAM) Managed Service Program. Bellevue, WA, USA – 8/18/17 – We are pleased to announce that Inviso was approved by Microsoft® as one of a select group of Microsoft partners to provide services through the Microsoft SAM Managed Service Program in the US. The Microsoft SAM Managed Service Program is currently available in the US and UK markets. The program is designed to provide a continual, governance-based, outsourced service, through accredited providers to help customers more effectively manage their software assets. By introducing customers to SAM best practices, tools, and resources while providing a complete view of their infrastructure, the program is designed to help them drive better IT decisions throughout all software and related asset lifecycle management. Customers who work with approved partners for the program, such as Inviso Corp., can receive unique Microsoft benefits. Some of these benefits include a reduced risk of audit and direct contact with Microsoft teams that can provide flexible licensing solutions and concessions. Customers will also receive continuous consultation on product end-of-life guidance and Microsoft SAM Optimization Model (SOM) maturity, and at least one ongoing value-based offering from their accredited provider such as a cybersecurity or cloud-ready consultation and roadmap. To ensure the highest quality of service, only Microsoft partners who passed a rigorous assessment based on industry standards (ISO 19770) and the Microsoft SOM could become accredited providers and offer services through the program. Accredited providers were also required to meet a set of initial eligibility criteria before being assessed. For example, Inviso Corp. was required to certify and must maintain certain certifications through the Microsoft Certification Program including Software Asset Management, Microsoft Volume Licensing, and Cloud Fundamentals. The program requires that all accredited providers undergo an annual reassessment to ensure they remain accredited and qualified based on program requirements. In addition to the required program certifications, Inviso earned optional certifications including Small and Midmarket Cloud Solutions, Devices and Deployment, Data Analytics, and Data Platform. “We are committed to helping all organizations maximize value, minimize risk, and achieve more with their IT investments through programs like the Microsoft SAM Managed Service Program. By making the necessary investments in developing their ability to provide high-quality, predictable SAM services, Inviso is able to be counted among a select group of organizations that have demonstrated the highest, most consistent capability and commitment within the SAM community,” said Patama Chantaruck, General Manager – Worldwide Software Asset Management and Compliance at Microsoft. Inviso Corp. is excited to begin working with customers through this program to provide valuable SAM services and help drive IT initiatives with a focus on helping customers realize their strategic Cloud initiatives across Microsoft Office 365 and Microsoft Azure. For more information about how Inviso Corp.’s SAM Managed Service can help drive your IT initiatives, please visit https://www.invisocorp.com/sam/managedservice/. We specialize in Azure, Business Intelligence, Marketing, Software Asset Management (SAM), and Staffing.